What situation(s) led to this Collaborative Decision Making Self Assessment? In what ways are Collaborative Decision Making vendors and us interacting to ensure safe and effective use? Do Collaborative Decision Making rules make a reasonable demand on a users capabilities? Is a Collaborative Decision Making Team Work effort in place? Is Supporting Collaborative Decision Making documentation required? This instant Collaborative Decision Making self-assessment will make you the reliable Collaborative Decision Making domain visionary by revealing just what you need to know to be fluent and ready for any Collaborative Decision Making challenge. How do I reduce the effort in the Collaborative Decision Making work to be done to get problems solved? How can I ensure that plans of action include every Collaborative Decision Making task and that every Collaborative Decision Making outcome is in place? How will I save time investigating strategic and tactical options and ensuring Collaborative Decision Making costs are low? How can I deliver tailored Collaborative Decision Making advice instantly with structured going-forward plans? There’s no better guide through these mind-expanding questions than acclaimed best-selling author Gerard Blokdyk. Blokdyk ensures all Collaborative Decision Making essentials are covered, from every angle: the Collaborative Decision Making self-assessment shows succinctly and clearly that what needs to be clarified to organize the required activities and processes so that Collaborative Decision Making outcomes are achieved. 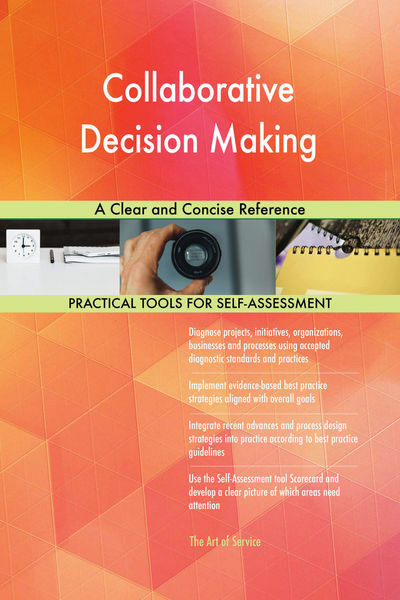 Contains extensive criteria grounded in past and current successful projects and activities by experienced Collaborative Decision Making practitioners. Their mastery, combined with the easy elegance of the self-assessment, provides its superior value to you in knowing how to ensure the outcome of any efforts in Collaborative Decision Making are maximized with professional results.